How do you think consumers, taxpayers, local governance and enforcement agencies would react if a federal or state law were passed which required herbicides (toxic chemical substances that kill plants) be sprayed by companies or contractors daily—every minute of the day—and those laws, plus the spraying activities those laws enabled, could not be opposed nor challenged by citizens or local governments for health reasons or other valid concerns, e.g., those herbicides were damaging and killing vegetable gardens, fruit trees, lawns including trees and shrubs, plus causing serious headaches, sinusitis, liver, kidney and eye problems, skin rashes and even brain fog? What if there were daily, hour-by-hour, minute-by-minute aerial spraying and dispersal of Agent Orange; Monsanto’s Dicamba ; Dow’s Enlist Duo ; or glyphosate ! Whoa! You probably are saying. Would there be “hell in camp” to pay by all parties involved, if that actually were to take place? With herbicides, there can/may be an unpleasant odor and/or an almost immediate immune response or reaction, e.g., breathing problems, skin rashes, burning eyes, etc. Whereas with microwave EMFs/RFs, reactions take place at cellular, molecular and neurological levels with short-to-long range consequences, one of which can be cancer! The most frequent short-range adverse health consequence is electromagnetic hypersensitivity (EHS)  or what an astute MD would diagnose as idiopathic environmental intolerance (IEI). Microwave radiofrequencies “spew” constantly from cell, stingray, GWEN towers and/or antennas of all sorts, magnitudes and bandwidths. The highly-anticipated 5G bandwidth will require more cell towers than ever to the point where one could be placed on your property without your approval or consent, and there’s nothing you can do to stop it according to regulations! The Telecommunications Act of 1996 is a law which stripped all States and local governments of their power to consider the potential adverse health impacts of RF radiation from Cell Towers and Cell Antennas, when a wireless company files any type of zoning application seeking to install them. Readers must realize, plus process intellectually, the fact that NO long-term human health or environmental safety testing has been done for the highly-touted, faster Wi-Fi, millimeter wave 5G or for the previously rolled out 3G and 4G—all of which emit constant electromagnetic and radiofrequencies, impacting human physiology, something consensus science and ICNIRP do not want to address despite microwave industry-funded studies finding and confirming 32% of studies performed caused non-thermal radiation wave adverse effects! 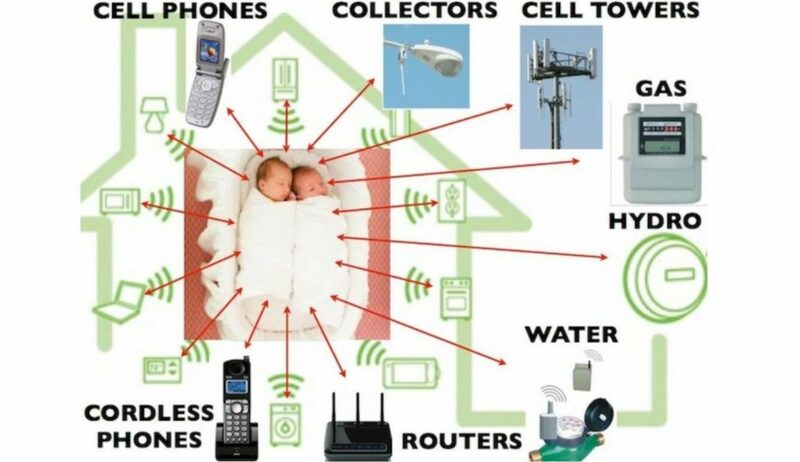 Until the U.S. Federal Communications Commission gets its act together about thermal versus non-thermal effects and identifies the safe SARs (Specific Absorption Rates) for microwave technologies and smart gadgets as actually used and humans live with and are exposed to—not the theoretical 30-minute-exposure studies, humans are subjected to 1996 FCC classifications, which are outdated, while the microwave industry aggressively pushes higher and higher bandwidths for faster and faster service. There are a variety of definitions for “non-thermal effects” included in different international standards. They start by the simple description that they are “effects of electromagnetic energy on a body that are not heat-related effects”, passing through the very general definition related to low-level effects: “biological effects ascribed to exposure to low-level electric, magnetic and electromagnetic fields, i.e. at or below the corresponding dosimetric reference levels in the frequency range covered in this standard (0 Hz-300 GHz)”, and going to the concrete definition of “the stimulation of muscles, nerves, or sensory organs, vertigo or phosfenes” [sic/phosphenes]. Here, we discuss what kind of effect does the non-thermal one has on human body and give data of measurements in different occupations with low-frequency sources of electromagnetic field such as electric power distribution systems, transformers, MRI systems and : video display units (VDUs), whereas thermal effects should not be expected. In some of these workplaces, values above the exposure limits could be found, nevertheless that they are in the term “non-thermal effects” on human body. Examples are workplaces in MRI, also in some power plants. Here, we will not comment on non-thermal effects as a result of RF or microwave exposure because there are not proven evidence about the existance [sic] of such effects and mechanisms for them are not clear. Source: Electromagn Biol Med. 2013 Jun;32(2):145-54. doi: 10.3109/15368378.2013.776349. The apparent reason “such effects and mechanisms for them are not clear” probably is due to the fact ICNIRP and other microwave industry associations, which provide ‘research data’ for the World Health Organization, keep saying more and more studies are needed, but apparently won’t perform them. However, the microwave industry did such studies and 32% found non-thermal adverse events from microwaves! During the last several decades, numerous studies have been performed aiming at the question of whether or not exposure to radiofrequency radiation (RFR) influences the permeability of the blood-brain barrier (BBB). The objective of this study was to investigate the effect of RFR on the permeability of BBB in male and female Wistar albino rats. Right brain, left brain, cerebellum, and total brain were analyzed separately in the study. Rats were exposed to 0.9 and 1.8 GHz continuous-wave (CW) RFR for 20 min (at SARs of 4.26 mW/kg and 1.46 mW/kg, respectively) while under anesthesia. Control rats were sham-exposed. Disruption of BBB integrity was detected spectrophotometrically using the Evans-blue dye, which has been used as a BBB tracer and is known to be bound to serum albumin. Right brain, left brain, cerebellum, and total brain were evaluated for BBB permeability. In female rats, no albumin extravasation was found in in the brain after RFR exposure. A significant increase in albumin was found in the brains of the RF-exposed male rats when compared to sham-exposed male brains. These results suggest that exposure to 0.9 and 1.8 GHz CW RFR at levels below the international limits can affect the vascular permeability in the brain of male rats. The possible risk of RFR exposure in humans is a major concern for the society. Thus, this topic should be investigated more thoroughly in the future. Source: Electromagn Biol Med. 2011 Dec;30(4):253-60. doi: 10.3109/15368378.2011.600167. What microwave technology consumers, and all humans, really must know—plus demand—is the correct and safe SARs for how humans use that technology and products, including any health effects from the gigahertz (GHz) ranges 5G Wi-Fi millimeter waves will have upon fetuses, infants, toddlers and adults, especially those who suffer with EHS or IEI, a population and demographics base which increases daily. All federal and state government agencies disclose only consensus science about herbicides and microwaves. Everything consumers know about such vested interests is generated by the very corporations who invent, patent and monetize them. If you have doubts about herbicides and other chemicals, then why wouldn’t you question microwave radiation issues? 2 Comments on "Microwave Radiation: Why Should Consumers Be Concerned?" Since the politicians can’t agree on anything, means anything goes. Nonthermal and thermal is about the craziest concept. a concept that was created in the 1950’s. Don’t rely on the government for any protection or standards.